One of our goals at the Clinton House Museum is to ensure the history of the house and its operations are documented as carefully as the lives of the people who occupied the home. In an effort to do that, we sat down with the artist who painted a large mural in the house to document her process and the story of how the mural came to be. Karolyn Farrell, a Fayetteville artist originally from Missouri, is a force of talent. She and Laverne Nelson painted the mural in the Clinton House Museum’s former screened-in porch. The mural depicts the rolling Ozark Mountains, trees and flowers, and a young girl swinging on a tree swing. 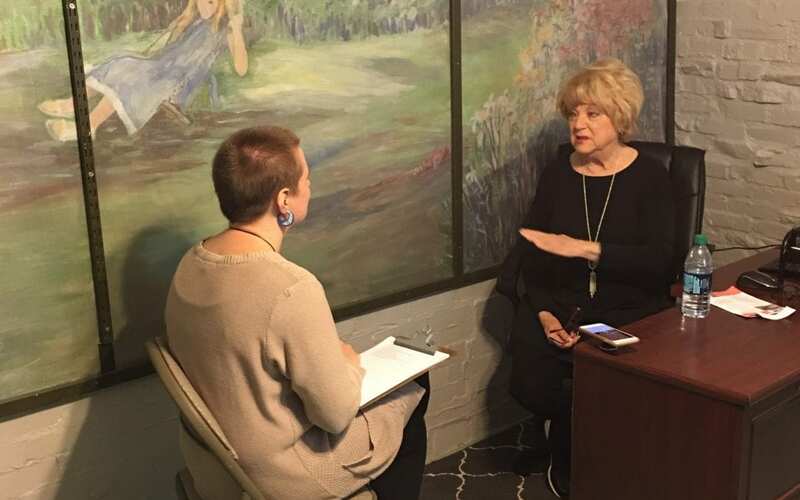 In 2007, Marilyn Heifner, the executive director of the Fayetteville A&P Commission, invited Karolyn to paint a mural in the former screened-in porch of the Clinton House Museum. Karolyn eagerly accepted and sought the help of her friend and fellow artist Laverne Nelson. Karolyn primarily used oil paints and Laverne primarily used water paints, neither of which were the right medium for the brick-enclosed porch. They decided to meet in the middle and use acrylics. After sanding the bricks, a museum volunteer primed the porch with several base coats to smooth out the texture. Karolyn sketched the mural with charcoal before diving into the painting. Karolyn’s impressionist style permeates the mural. The focal point of the mural is the blonde young girl swinging on a tree swing. The girl represents Chelsea Clinton, although Chelsea was not born while Bill Clinton and Hillary Rodham lived in at their Fayetteville residence. Karolyn used her granddaughter Caitlin as a model for the mural. Karolyn and Laverne took Caitlin to Laverne’s home in east Fayetteville where there was a similar tree and swing, and Caitlin posed for the inspiration of the scene.